I'm so excited to see so many new faces!! One more day left for Giveaway Day... enter here if you haven't already. I'm making good progress on the Love quilt. The top is finished. I decided to trade the piano keys of the original for white, and the solid skinny border for a scrappy one. I really like the effect. There will definitely be more scrappy borders in my future. A few more decisions have to be made before I can get this baby finished. 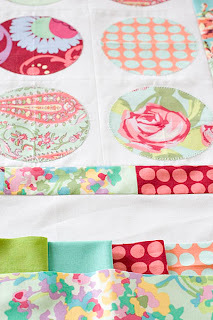 1) I need to commit to quilting pattern. Some ideas running through my head are free motion, a small 1.5" square grid, pebbles. 2) After the quilting comes... anyone? Yes! The binding. Sadly, I couldn't find an appropriate stripe in my stash. Ack. I guess I will have to branch out a bit. From top to bottom: quilt top, binding options, and backing. I'm leaning towards the aqua solid. Opinions?? Lovely quilt top. Your backing fabric is gorgeous. I'd bind with a solid; aqua works well. MQing? You'd want those circles to pop. The grid would be so great but that is a LOT of stops and starts so maybe a small pattern like the teeth of a comb or maybe fingers is a better picture in each square going right to the seam and then those finger tips could almost touch each other. It'll be wonderful! I love the red with the pink polka dots for the binding, but I'm a sucker for polka dots for bindings. BUT I think the solid aqua would look really nice too! Love this! Love the scrappy border you added too. I'm leaning to one of the solids for the binding, which would frame this and really pop. Pebbles quilting might look cool, to echo the circle shapes. Nice job with this! i love this...the aqua will make a beautiful border. yes I agree the aqua solid pulls it all together without taking away from the quilt. personally, i like the aqua solid. Was out blog hopping and found yours! 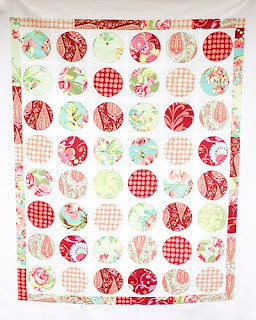 Love the quilt, so very pretty. I have not tried circles yet and am always impressed when others can. Great job! Oh man! The pattern and fabric are delicious. Can't wait to see this quilted up! Gorgeous! I think I'd go with the aqua, too.